The annual festival is back in the capital from today until 21 February. Linjia Zheng (5) helps launch the Chinese New Year Festival earlier this month. 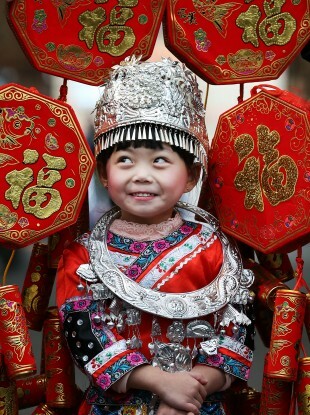 THE DUBLIN CHINESE New Year Festival returns to Dublin this weekend to usher in the year of the monkey. Now in its ninth year, the two-week festival features a mix of art, music, storytelling and food. Here are our picks of the best events taking place across the city. Try your hand at Chinese board games, calligraphy, kung fu and sugar painting at this two-day extravaganza in the CHQ building at Custom House Quay. The New Year’s Gala – the annual Chinese variety show watched by hundreds of millions across the world – will be screened live tomorrow afternoon. Culture guide Le Cool is hosting two separate walking tours of Dublin’s Chinatown hotspots – the perfect opportunity to explore more off-the-beaten-track parts of the city. The meeting point is confirmed once you book your ticket. Author Eddie Lenihan will lead a Chinese-English storytelling session based on Irish Tales of Mystery and Magic, his collection of ancient legends, at the Central Library in the Ilac centre on Tuesday week. The event is aimed at kids aged between seven and 12. Get up close and personal with monkeys at this Dublin Zoo workshop. Participants will be shown how to prepare and deliver some of the props and food items used to stimulate the animals. Oriental food wholesaler Asia Market is offering a tour of its Drury Street supermarket, including a guide to the best ingredients needed to cook authentic Chinese meals. The €5 ticket price includes a complimentary goody bag. For those in search of a more hands-on food experience, Söder + Ko chef Kwanghi Chan will be doing a cookery demo at Cooks Academy the following week. The hour-and-a-half lesson will go through the steps of making a traditional Chinese New Year dish. In 1911, the last dynasty of China, the Qing, was toppled in a revolution that brought 2,000 years of monarchic rule to an end. Interested in learning more? Head to Trinity College Dublin for Dr Isabella Jackson’s lecture on the anti-imperial movement, and how it compares to later revolution in Ireland. Shan-Zhen explores the influence Shannon had on Shenzhen, a city in southeastern China, as it urbanised in the early 1980s. The interactive exhibition – a collaboration between photographer Matthew Thompson, two architecture firms and a Dublin film production company – features archive photography and two short documentary films examining the unlikely historical connection between the two places. Musician Wu Wei is one of the world’s leading players of sheng, the traditional Chinese mouth organ. He will perform with Andreja Malir, principal harpist with the RTÉ National Symphony Orchestra, in the Chapel Royal at Dublin Castle next Saturday. Email “Here's what's happening in Dublin for the Chinese New Year”. Feedback on “Here's what's happening in Dublin for the Chinese New Year”.